Billions of people in emerging markets live in informal, self-built housing. According to the World Bank, over 75% of the housing stock in sub-Saharan Africa is self-built. This is a consequence of the economic realities of emerging economies, global poverty, and the limits of financial markets. While self-built and informal methods can be expensive and personally demanding, they are still more affordable than traditional methods of construction for most of the world’s poor who cannot access a reasonably mature mortgage market and housing finance products. And while microfinance products have made some progress reaching the bottom of the market, they rarely offer technical assistance to support the construction process. Most of the world’s poor are left largely on their own to secure rights to occupy land, access finance or savings, and design and construct their home, which they then do incrementally, over time. This leads to visible characteristics that have become associated with incremental housing construction, such as haphazard and chaotic looking building processes and neighborhoods, despite actors behaving in economically rational ways. In these markets, families must find their own sources of financing, recruit and compare contractors, manage these contractors, ensure the quality of construction materials and enforce levels of building standards for safety and durability. That is a lot of responsibility for anyone to take on, but extremely taxing for the poor. So much can go wrong in the process, and often does, especially when it comes to building safe structures that can withstand shocks such as natural disasters which always effect the poor and their assets more than others. At the very least, providing a way for families in the informal economy, with incrementally and self-built homes to more confidently approach contracting and construction markets available to them, can bring higher standards and more resilience to communities living in poverty. In turn, this can be one small step in driving more adaptive methods of financial inclusion. 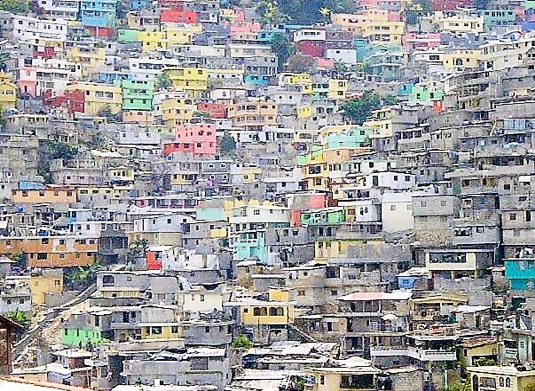 Jalousie neighbourhood in Port au Prince. A maze of self-built houses. Many are familiar with the Build Back Better movement, which stresses the importance of rebuilding after a disaster with resilience in mind. But it is actually more efficient and cost effective to build better first, rather than repairing after the fact or retrofitting existing infrastructure and housing stock. This is precisely the motive behind the Build Better Beforemovement. There are many operational and oversight obstacles to the microfinance industries operating in informal housing sectors, as lenders usually have little control over what happens at a job site. Households sometimes know little about construction standards and techniques, and contractors are not always accountable based on their ability to deliver safe, resilient houses. New technologies are helping to bridge the communication and data gaps by connecting stakeholders in these markets. One particular way to do this is through mobile applications that centralize information and provide more consumer protections and confidence. Most of us do this already through apps and sites like Uber, Lyft, Yelp, TripAdvisor, HomeAdvisor, and Angie’s List. Most of the applications on the market for home improvement, however, are still constrained by the conditions and challenges described above and are not viable products for kinds of assets and income streams present in informal economies. Additionally, issues of professionalization, building standards, and resilience for the extremely poor around the world are not features of even the most sophisticated and mature platforms. iBuild is a new application and platform that provides households, financial institutions, contractors, suppliers and more, with the ability to access data, connect, perform secure transactions, and share ratings. Bringing this model to home construction helps to formalize and professionalize some of the processes, such as documenting contracts and promoting higher building standards by making contractors more accountable to their clients and by rewarding good companies. The application is in a soft launch stage in Kenya and has established piloting partnerships for the Indonesian, Indian, Nigerian and South African markets. I’m personally excited about this platform because it solves multiple problems at once. iBuild can make housing construction more affordable and safer. Through the app, households gain access to information that will enable them to compare bids from contractors and suppliers, allowing them to benefit from a more competitive market, and stay on top of fluctuating costs for building materials. In the Democratic Republic of the Congo, the price of a bag of cement can fluctuate between ten and 45 dollars depending on where and when you are buying. In my own work, I have encountered time and again contractors underestimating construction costs and charging steep increases for overruns. Because iBuild transactions are tied to a formal contract, contractors are more accountable and will likely price their services more fairly. This is applicable to both the formal and informal markets, and is particularly useful for informally employed households adding on to an existing structure with higher quality work and materials at a reasonable rate. Rating systems enable good contractors to differentiate themselves from those who offer worse quality services at uncompetitive prices. Contractors and laborers can easily find work through the app, build their credentials, and demonstrate their capacity to future clients. The app can also help educate homeowners who may not be familiar with building techniques and provide examples of good masonry or carpentry work. Building more resilient housing before disasters happen is crucial to mitigating damage, protecting these underserved assets, and, most importantly, saving lives. Before and after adding another floor. 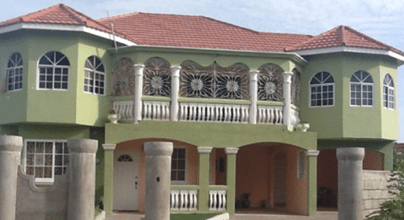 An example of incremental construction in Jamaica. iBuild can also help households gain access to credit and increase financial inclusion. Many emerging economies, such as Liberia or Sierra Leone, lack credit bureaus and many households don’t have a credit history which makes it almost impossible to secure a decent loan from a formal institution. By using mobile banking, households can keep track of payments for however they are financing their project. This data can be transferred to financial institutions which can encourage banks and lenders to go down market, saving on underwriting costs, and ensuring that loans are used by tracking construction progress through the app. There are still other major issues that are beyond the app’s reach, like tenure security, which is a huge red flag for lenders. In sub-Saharan Africa it is estimated that less than 30% of land is titled. Other disruptive technologies like blockchain are seeking to tackle issues about tenure and property rights. But, in the meantime, iBuild represents an innovation that combines many of the more efficient tools we have at our fingertips to promote growth and development for self-built housing. New technologies like this empower consumers to make more informed decisions on a major investment—their homes. The technology encourages safer building methods and promotes affordability by simply collecting information in a single place that can be accessed by anyone with a phone. Providing elements of formality to these transactions help pave the way for making these assets more bankable and easier to monitor. The public sector and other affordable housing professionals can also benefit from whatever data comes out of implementing iBuild. Some markets are thin on information and it’s difficult to get a sense of the ecosystem if you’re not embedded in it. Studying the behavioral data of mobile applications can help us determine market constraints and opportunities, and provide better recommendations and solutions to affordable housing challenges around the world.